IMO the street/park formats are a little boring. Half the runs are lost to skating to and from obstacles. Also doesn’t help that people will compare them to video parts which are weeks/months of highlights crammed into a single video. That’s one reason vert and mega might be more popular than street/park to the general public; at least there’s the speed, height and danger factor to entertain the uninitiated. I don’t like the idea of skating in the olympics and I’m a skater (an old and crappy one). It doesn’t translate well to TV; I find it more entertaining watching some local ripper shred the bowl. Dudes I met as teenagers when our local was built are now hot skaters (it helps being coached by one of Australia/NZs best skaters) but none of these guys care for competitions, they would rather smoke a doob, have a couple of beers and show off to each other. For the most part skating isn’t a competitive sport, it’s more of a lifestyle where people support each other rather than compete. 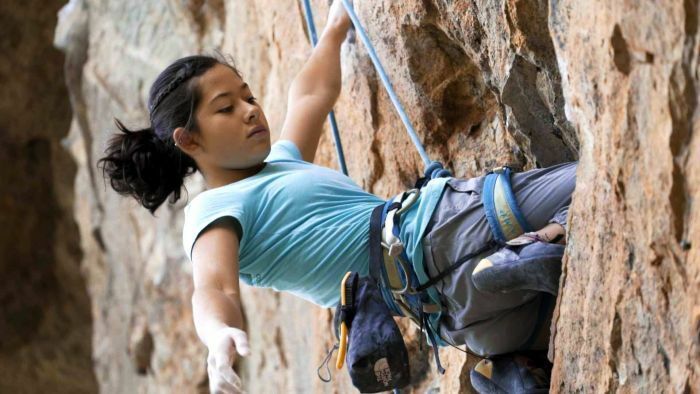 Angie Scarth-Johnson is gunning for a place in Australia's first Olympic climbing team.